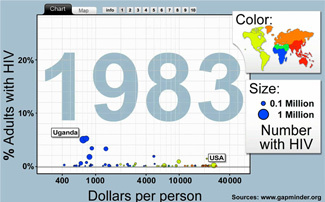 This presentation was used by Hans Rosling in his 2009 TEDTalk – “HIV – new facts”. You can now use this presentation in your own lectures. Just download the Flash file and follow the instructions. There is also a “generic manuscript” available. Dear John, I am sorry but I can’t find any problem on this end. Please try again and let us know if it still doesn’t work and we’ll try to et it to you some other way.